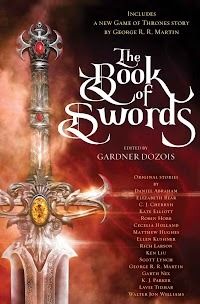 "The Triumph of Virtue," by Walter Jon Williams [bio] (edited by Gardner Dozois), appeared in The Book of Swords (RSR review), published on October 10, 2017 by Bantam Books. Pro: The setting is well done, particularly the political situation. Quillifer becomes a real person for us, and it’s fun rooting for him. There’s plenty of suspense and excitement in the final fight scene.